These are so adorable!! And what a great way to preserve treasured pillowcases from your grandmother! What an oiriginal idea and a great way to carry on the tradition of grandma’s linenes to a new generation. Many things like hand stitched linens are lost or forgotten, not seen for the priceless treasure they really are, but this brings them right back into the limelight where they deserve to be. Love, love, love! These dolls bring back memories! My Mom, and grandmothers, embroidered lots of pillowcases and Mom made dolls from many of them. Wonderful! Beautiful! I love them! My grandmother also embroidered and embellished pillowcases a lot. She got into the fabric paint–liquid embroidery, I think it was called, and did a lot of that too. I found a sheet she made for my son that had a drawing of ET on it! A weird heirloom! I wish I had some of her wonderful pillowcases to make into dolls, but I think all the ones we got from her, we used until completely worn out. You must have had a way-cool granny to draw ET!!! 🙂 I love that story! These are adorable. I may even try my hand at making a couple for Christmas gifts. I just hope my sewing skills are good enough. Wow those are totally awesome!!! Q – I have a book on this I bought years ago. Did I ever make one? Don’t ask. LOL! These are great! What a wonderful way to display those handmade pillowcases! I’ve never seen those before! Delightful. No kidding! You amaze me with all you do. Your writing, your crafting. Top notch! They are gorgeous!! And to give old pillowcases a new least of life….i love that. They would look lovely sitting on a bed. You done it again!!! I see you’ve been a busy lady as usual. You are going to make some little girls so happy, are they for Christmas. Clever use of a cherished item. 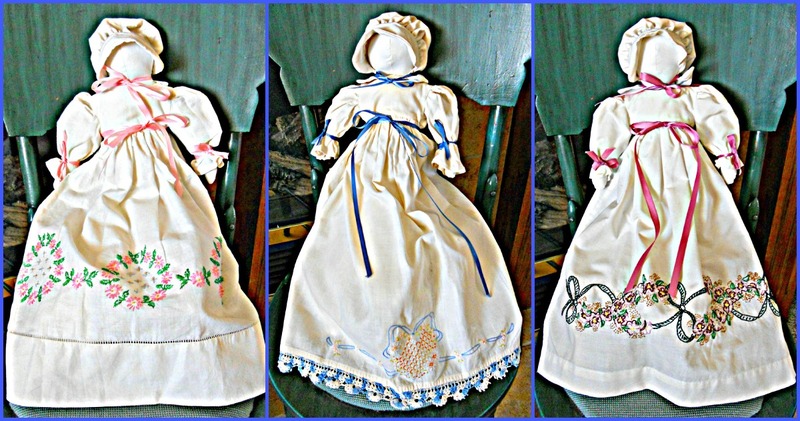 I just love these, I wish I had old pillowcases from a grandmother, they would be a perfect gift for my niece. You are so talented. Oh my, These are soooo adorable! Really love them. TFS. I have pinned them. Hope thats ok. Have a wonderful weekend. They are so pretty and inspiring. My fingers are itching to start. so beautiful! they would also just make a lovely decoration sitting on a chair. they are beautiful!!! and what a nice way to show some lovely hand embroidered fabric! These dolls are really beautiful… I love vintage inspired dolls. Great job!!! These dolls are so sweet! These are so adorable…oh my goodness adorable, love them! These are great. I am searching for a pattern to make one for my little girl with grandma’s pillowcase. Will you suggest one? The pattern I used was a bedraggled copy of a copy from a friend, and I don’t have it anymore. 😦 But . . . I just googled “pattern for pillowcase dolls” and it looks like there are some available online, especially on ebay. I wish you good luck in your search, Kathryn! These dolls really are precious in every way. Thank you visiting my blog :-). I am so glad to have come over, these are gorgeous! I really appreciate this kind of artsy-craftsy folklore art. If I could sew beyond just a button repair stitch I’d give this a try myself. Thanks visit my blog. I have several pillow cases like this handed down from my grandmother and great grandmothers. Right now they sit in my closet. However, I have three very young god daughters now. This would be an incredible gift that my grandma and I could do together for them. Thank you so much for the idea. 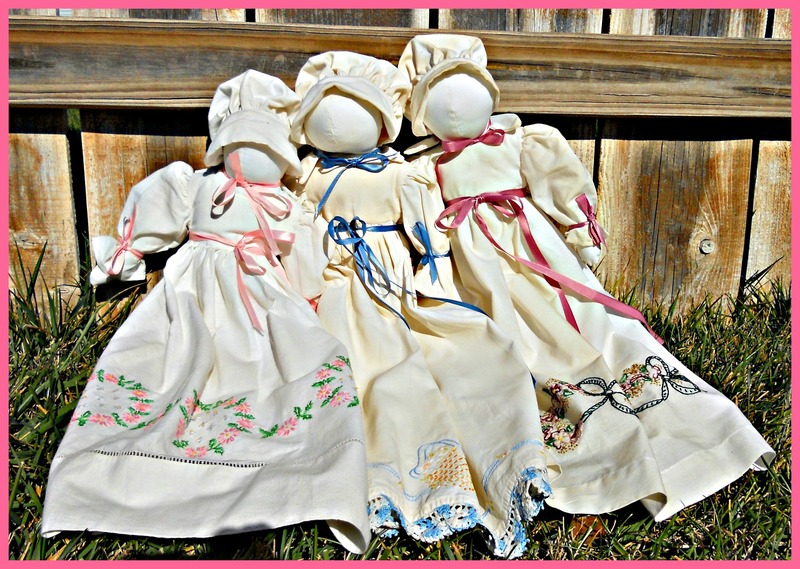 These linen dolls remind me of a large angel doll that stands on a water-filled soda bottle or on top of a Christmas tree. My sister bought several as Christmas gifts from someone who handmade them. I have had mine for years. I love old linens and am finding some uses for the ones I inherited. Not sure I have any pillow cases though. I do know someone who collects them and uses them on her master bed pillows. Thanks for subscribing to my blog. Most appreciated. I can see I simply must join yours too. By the way, how did you hear of me, if you don’t mind me asking. I am looking to build my following. Thanks for letting me know where we connected. Are you writing books, magazine articles etc. in addition to your fabulous blog? You are one interesting lady! I’ve written teacher guides for books and for Cobblestone magazine. No books, yet. I’m working at it! Thanks so much for sharing!